Each utility in the coalition will contribute $20,000 to a feasibility study for a massive municipal water pipeline project called the Colorado-Wyoming Cooperative Water Supply Project, which would pipe water for 532,000 people from Wyoming’s Flaming Gorge Reservoir to the Front Range. The coalition of utilities includes the town of Castle Rock, the Donala Water-Sanitation District in Colorado Springs, Parker Water and Sanitation District, the South Metro Water Supply Authority and Douglas County in Colorado and Laramie County, Wyo., and the Wyoming cities of Cheyenne, Torrington and Rawlins. 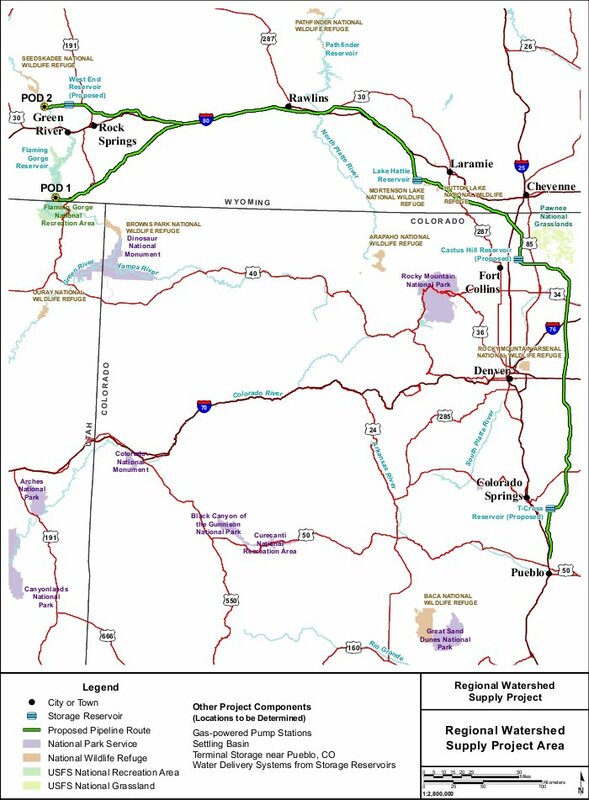 The project may mirror Million’s proposed 500-mile long pipeline, which would take about 250,000 acre feet of water from the Green River above Flaming Gorge Reservoir, pipe it over the Continental Divide along Interstate 80 and deliver it to thirsty Front Range water providers, mostly agricultural. The difference is that Million’s project is private and concerns only Colorado water organizations, while the Colorado-Wyoming project has the cooperation of the U.S. Bureau of Reclamation and would serve only municipal water utilities in two states. At a news conference Thursday at the Capitol, the announcement was met with enthusiastic support from several state lawmakers, including Sen. Mary Hodge, D-Brighton; Sen. Ted Harvey, R-Douglas County; Sen. Mark Scheffel, R-Parker; and Rep. Su Riden, D-Aurora. While Million has spent the last four years pitching his project around the state, major water suppliers have been cautious about supporting it. Earlier this month, the Arkansas and Metro basin roundtables agreed to ask the Colorado Water Conservation Board for funding to study setting up a task force proposed by the Pikes Peak Regional Water Authority to look at both projects. At its meeting last week, the Southeastern Colorado Water Conservancy District agreed with that approach, rather than endorsing either project. The project, if it goes forward, would require permission from Congress, but participants don’t believe they would have to renegotiate the Colorado River Compact, which allocates the river among Arizona, California, Nevada, Colorado, New Mexico, Utah and Wyoming. Although it would be drawn from Wyoming, the water would come from Colorado’s allocated share of water in the Colorado River system. “The state of Colorado’s own State Water Supply Initiative clearly says that even with all the water projects currently in the pipeline, the Front Range and Platte River Basin will face significant water shortages in just a few decades,” said Frank Jaeger, general manager of Parker Water and Sanitation District, who organized the coalition. Participants and their projected water needs include the Parker Water and Sanitation District, 125,000 people; Castle Rock, 85,000; the South Metro Water Supply Authority, 190,000; Douglas County, 45,000; the Donala Water and Sanitation District, 7,000; Cheyenne, Wyo., 55,000; Torrington, 5,000; and Laramie County, 20,000. No one can agree how much water is left to Colorado under the compact. In the worst-case estimates of long-term droughts or a warmer climate, Colorado already is using all of the water it legally owns. The state government is working on a model to get a better answer to the question. Leaders at the Western Slope’s largest water district have no problem with Front Range utilities doing a study, but they hope it takes into account climate change and drought, said Jim Pokrandt, spokesman for the Colorado River Water Conservation District. “It doesn’t matter who’s looking at the project, the same issues stand. We need to get further into the Colorado River Water Availability Study to see how much water is left to develop,” Pokrandt said. More Colorado Wyoming Cooperative Water Supply Project coverage here. More Flaming Gorge pipeline coverage here and here.